This is a herbaceous perennial plant commonly referred to as Gayfeather and Blazing Star for its feathery flower heads. 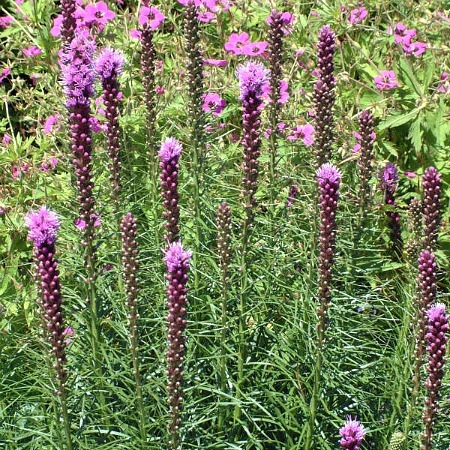 A native garden plant to North America, it is characterized by bright lavender-pink flower wands that appear to smolder at the tips giving it another name, the blazing stars. It grows in tall stalks with low grassy clumps and leaves that are 10” long at the base of its stem decreasing gradually as they come up. Its average height is 2ft and extend to a 1ft width. Each stalk terminates in a head of fluffy disk flowers. Liatris spicata Kobold requires regular watering when it first beings growing until its extensive root system is established. The watering frequency can then be reduced, although you will need to maintain moisture. Plant it in fertile soil although it is a hardy plant that will survive in poor soils. It is also intolerant of wintry wet soils. It is a perfect choice for southern gardens due to its tolerance to hot sun. Its tuberous roots can be divided to one eye per division and replanted. Dust the ends with fungicide to avoid infections and plant at a depth of 4-6”. Once established it spreads 12-16 inches. The pink Liatris makes a great selection for a border plant and is a staple in cutting flower gardens. It attracts butterflies and bees and is deer resistant. Plant it in an eclectic or prairie style garden to add a bright vertical variation. Although it is naturally adapted to meadows, it is a stunning component in sunny beds and marsh margins. Plant it alongside other colorful perennial garden plants for a stunning color contrast. The Liatris poses no insect or disease problems and does not require staking. Thank you to Walters Gardens for their colorful image of the Liatris spicata Kobold flower.